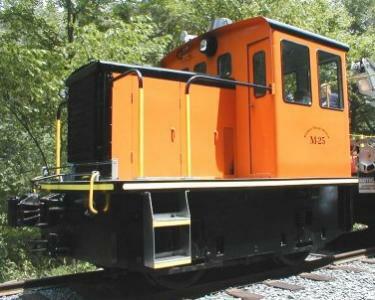 This small locomotive is typical of General Electric’s early single-ended locomotives built for industrial applications. It was built in 1942 for use at a Hudson Motor Car plant at Centerline, MI. Information received from a Hudson authority in 2006 indicates this plant built 20mm Oerlikon anti-aircraft guns for the Navy. (The Hudson Motor Car plant has sometimes mistakenly been thought to have built torpedo boats). Centerline reportedly had space for 20 rail cars on a 900 foot loading dock, so the loco was probably kept quite busy at its first home. Hudson lost the contract to operate that plant in October 1943; sometime around that date the loco was moved to the Naval Mine Depot at Yorktown, VA. Following WWII, it was sold to Tidewater Oil Co. in Delaware City, DE. 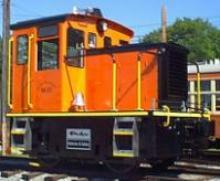 By 1972, it had been sold to the American Bridge Division of US Steel at Elmira, NY. While with AmBridge, the locomotive reportedly served during construction of the I-81 bridge over the Susquehanna River at Harrisburg, PA. It was used to shuffle loads of steel out onto the bridge for placement by a traveling crane. The locomotive was at the AmBridge plant in Elmira when it changed hands to Sumitomo Corporation, ABB Traction, Adtranz (ABB-Daimler Benz Transportation Systems), and finally DaimlerChrysler. All these companies performed construction and overhaul of trolley, subway, and light rail equipment, so the locomotive feels right at home at our facility. One of the first tasks after receiving the locomotive was to obtain starting batteries. We’d like to extend our sincere gratitude to Deka Battery (East Penn Mfg.) of Lyons Station, PA, for their assistance with that task. Once the engine was started and run, we realized we would need to replace the obsolete single-disk fuel pump with a more modern PT pump. 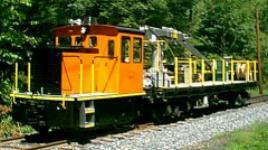 With that lengthy task complete and the engine running again, we realized the air compressor was worn out, so we replaced that with a rebuilt unit with the help of Hantz Locomotive Service in Pittsburgh. Finally, with the locomotive painted and looking great, components of cylinder #6 failed suddenly and disabled the engine completely. With lots of searching, we found parts we could afford and rebuilt that cylinder. 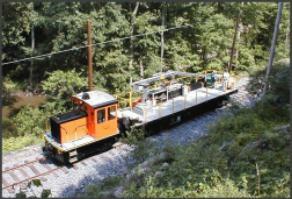 The locomotive was finally placed in service in July of 2001, and was critical to completing overhead construction for our track extension in a timely manner. 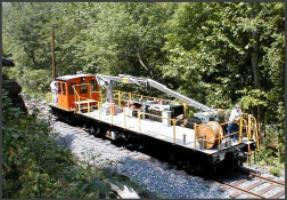 The M-25 supplements our Brookville gas locomotive for moving trolley cars and work equipment. At more than three times the weight of our Brookville, the GE makes moving heavy equipment like our bucket car, cabooses, and “Liberty Liner” much safer and easier. Coming or going, the M-25 makes moving our custom bucket car a lot easier! We’d like to thank the Pennsylvania Trolley Museum for bringing this locomotive to our attention, and the former Adtranz (DaimlerChrysler, now Bombardier) personnel for arranging for us to acquire it. We thank the following businesses for advice and hard-to-find parts: Ed Grimm’s Truck Parts of Douglassville, PA; Miller Diesel of Harrisburg, PA; Larry’s Truck Electric of Warren, OH; Crump Diesel of Cohoes, NY; Ashland Diesel of Ashland, PA.
Have a similar locomotive? We have surplus Cummins diesel parts listed for sale here.